Nice game, simple yet engaging gameplay loop. But, having said that, Rollerpig is truly OP. Fun. Reached floor 36 with no problem using Roller Pig who is way too overpowered (just hold F the entire time) until I could no longer progress because a block formed in the way of the only path to the exit. Wish the keys D and F were customizable. There seemed to be a memory problem in which the game slows down due to skeleton production but the lag persists even to new rooms. Dying and starting over with a new character solved the issue. The movement mechanics are very fluid and the color palette is simply beautiful. This is where I got after ~2 hours of playing, but I closed it afterwards and didn't get to try out the unlockable characters. Great work, good luck with Ducksoup Dungeon 2! Wow, you're good. I've been grinding every day for a week and my highest is 29. Thanks, though I rely mostly on spamming attacks (especially when slow motion kicks in). Also, you can essentially hover in place while attacking downwards, which is a good way to clear out enemy stacks. Yup, I'm using the same tactics ;) Slashchicken is the only useable character for later levels in my opinion. If Bonerat can't get his bone back, he's as good as dead. How is it bugging out? I've managed to get to level 29 without any bugs. This is a really fun game although id like to say that if you start the game and quickly choose another character you can play as them even if they are not unlocked. I found one level that had the exit blocked btw. I finally managed to beat my floor 16 run. I died next to the entrance to floor 20. Honestly, after playing for multiple hours, this game is actually amazing. Good Job. Is there a secret character to unlock??!! What do you mean? There are only four characters that I'm aware of. Neat little game! Yeah piggy is invincible, but the concepts are well executed for what it is! This is a cool pixel roguelike game for anyone who feels nostalgic about Gameboy games! Love the graphics. Super fun too! Awesome game, the visuals are super cool, real time lighting is awesome. Really like the fact that there different characters to unlock with different attacks. Also the infinite jump felt like quite a clever feature to me. Woah that looks cool! Can't wait to see how it evolves. Hey great work on the current version. I love the slashchicken and the Mother Russia bug. I have a few questions tho. Are the extra blocks that are in the way of your progress apart of the game and im just really stupid, or is it a bug in the random generator? I'm very happy with your work and I hope you keep working on this. Thanks! However if I remember correctly, you can destroy (and create) blocks with the mouse. It's a little debug thing I forgot to remove. But for thjs situation it's quite helpful! Thx for responding. I actually want to try what u said. Maybe it could be an idea for puzzles in your latest work. Thx again for responding. Great aesthetic, fun to play. 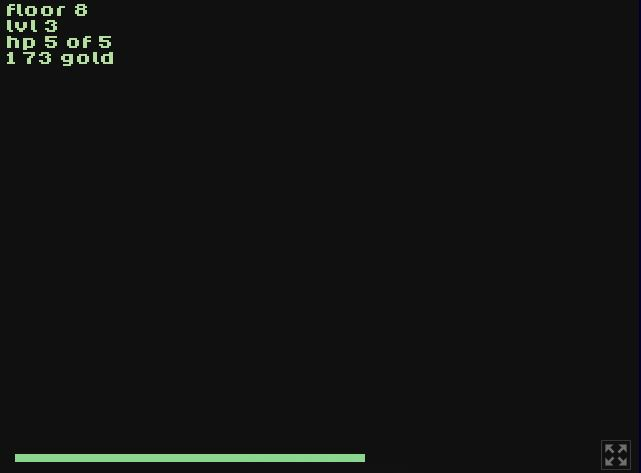 Very fun little roguelike with minimal features... too bad that half of my runs end when I find a generation glitch where I can't get to the next floor. I am very fond of this concept. It has a classic arcade feel with some fun little twists. 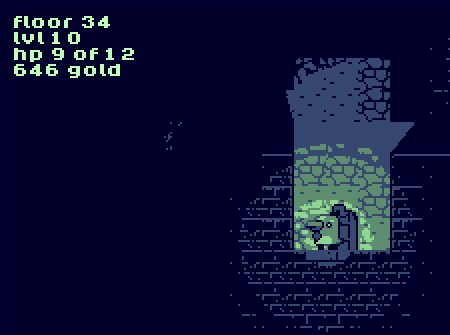 I really enjoy the lighting, monochromatic scheme, and the cute and creepy 8 bit sound track. I also quite like the lighting dynamics. I do have a couple of critiques. 1. The control scheme isn't really all that intuitive in my opinion. I would opt for ASDF controls, with spacebar jump and click attack, given the option. 2. Slash Chicken and ratbone are very vulnerable characters. Their attacks don't invoke an invulnerability state, or prevent enemies from hitting you in any way that I can tell. Rollerpig, on the other hand, is an easy choice, seeing as for as long as you are holding attack, you are nigh invincible, and constantly attacking, while also receiving a boost to mobility. I think rollerpig was fun, so maybe only a minor nerf to his attack if any, such as certain actions breaking it, or maybe a stamina bar? The others definitely need a buff of some kind, or a defensive ability. I can see why the playable characters were lined up in that order, as Slasher Chicken is able to juggle enemies with it's sword, Roller Pig can roll around, even in the air, and not get hurt at all, Swarm Bug and Rat Bone both require some strategy in terms of how and when to dispatch enemies, with Rat Bone being very satisfying when his boomerang ricochets all around a room and hits everything (aside from when it travels through a wall, disappears, and magically reappears in your grasp :p), despite needing to occasionally fetch it when it goes to far, while Swarm Bug's minions can only attack from the side and below. Slasher Chicken and Roller Pig are the best characters in game. Really interesting game. The light movements through the corridors are really interesting and could be more used with the intention of put a strategy movements to split and face the enemies separately. The lack of diversity of enemies and characters power-ups and level design let the stages make the game boring but it can be enjoyed for a long time still, considering its a jam game. Congrats peep!! I want to adopt slashchicken. What a cracking roguelike type game you guys have developed. I know the publish date and I've looked at this a few times and thought "I'll maybe play it later" but I wished I'd have played it sooner. I was having so much fun and enjoying Ducksoup Dungeon that the 10 minute video became a 30 minute video. Well, as soon as you have playable demo can you guys let me know. I'd love to do a video/review. Super impressive job for a jam entry Woah! Controller support would set it off for me! but wow... what a fantastic effort! Well done guys! Can you add ways to make the character you choose stronger? I love it! Got a couple of small requests though: a mute button, at least for the music, and more importantly a pause button. Thanks! Amazing game ，but a bit of a defect，pig almost invincibility.